Color swatching for the new dragonfly series I’m working on. Having recently accepted an invitation to fill a last-minute gap in the show calendar at Hudson Hospital, I’m in the “final countdown” phase of prepping for a show. No matter how diligent and organized I am, I seem to always require a final frenzy of activity to bring everything together in the last 3-4 weeks before a show. This time, because there are only about 6 weeks from the time I accepted the invitation to when I have to deliver the work, I’m simultaneously in the “start-up and exploration” phase (the few months of a new body of work). It’s a challenge to stay open to where the work is telling me it wants to go with a looming deadline! 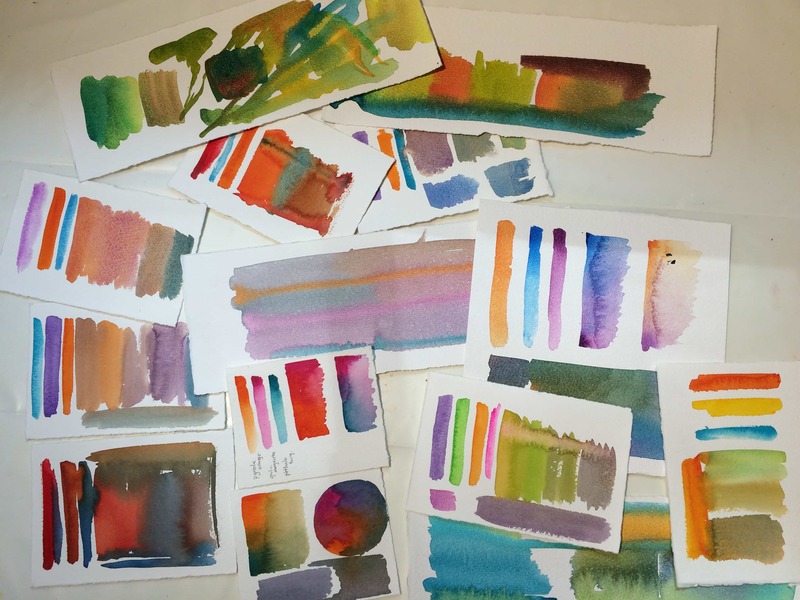 For me, one way to keep from being overwhelmed—and to make sure the work hangs together well—is to select a limited collection of pigment combinations that I use throughout the series. Borrowing a term from fiber artists, I call these my “colorways” for the series. Each color way includes what I think of as my “primary triad” for the colorway and possibly a fourth or (very rarely) a fifth color. The notion of “primary” really gets stretched here. For example, one colorway that I’m working with now consists of quinacridone deep gold as my “yellow”, phthalo turquoise as my “blue” and permanent violet dark as my “red”. Typically, there is enough overlap in the 3 or 4 colorways within a show that I’m using about 7-8 pigments for the entire series. For me, the process of choosing these colors takes some experimentation—for most of the decisions I have to make about a painting, I just don’t know how I feel about it until I see it on the page! If you saw my earlier post on this series, you know there were a lot of duds in that first week! Then I got smart and settled down to do some “swatching”. Actually playing with the pigments—wet-in-wet, premixed on the palette, dropping color into partially dry washes—seems to be an essential step for me. You know how I’m always advising you to “deal with one difficulty at a time”. Yeah. I have to give myself that advice, too. For me, there’s no substitute for messing around with the actual pigments, but it also helps a lot to read about pigments and color theory. While I’m immersed in show prep, I thought perhaps you’d enjoy checking out a few of the resources on pigments and color that I find myself returning to again and again. Color: A Natural History of the Palette, Virginia Finlay. Finlay has also recently released a newer book on color with a lot of color plates and examples. The new book is visually appealing, but I think this one is more readable. Bright Earth: Art and the Invention of Color, Phillip Ball. Absolutely fascinating chronicle of the interaction between art movements, art personalities, commercial uses of color (especially dyestuffs), politics, color chemistry and culture. Hands-down my favorite book about color in art. Making Color Sing (25th Anniversary Edition), Jean Dobie, or click here for used copies of the original hardcover on Amazon. Probably the gentlest introduction to the practical application of color theory in watercolor, with plenty of exercises you can try with your own paints to understand the concepts. A great introduction to the most common way of discussing color combinations (complementary/split-complementary/monochrome/analogous). Quiller also markets a palette (and recommended colors for it) arranged in a color wheel (with special wells for primaries) to help students learn to mix and understand colors. If you find yourself struggling to mix your own greys or mute color with complements, this book (and perhaps the palette) can be very helpful. Test out how various Golden acrylic colors will mix without buying them. Since color is represented very differently on a computer monitor than the way actual paint behaves, this is a more sophisticated piece of software than you might realize at first. Fun way to “try before you buy”, but also a way to explore the mixing of a lot more pigments than most of us would want to purchase just to practice with. Although there are some differences between the color lines for watercolor and acrylics, much of what you learn here will transfer to watercolors. Want to find out how good you are at distinguishing different colors? Try this online color perception challenge. The quality of the monitor you’re using and the lighting in the room can affect your score somewhat, so don’t be dismayed if you don’t score quite as high as you expect. Try again in a darker room or on a high-quality monitor. I’m betting most of you will score quite high on this challenge! Do you have a favorite color resource? Share it in the comments!